Between 30 and 60 days prior to the course start date, BICP will retain 25 percent of the course fees. Between 15 and 29 days prior to the course start date, BICP will retain 50 percent of the course fees. Less than 15 days prior to the course start date, no refund will be issued. BICP reserves the right to cancel any training course due to insufficient enrollment at least 30 calendar days in advance of the scheduled course date. Notice will be provided with the option to reschedule for a future course date or to receive a full refund of registration fees. BICP is not responsible for any expenses incurred by the customer if a training course is canceled. If a training class is canceled due to any unforeseen circumstances such as weather or natural disaster, the customer is entitled to reschedule for a future training course. Special circumstances will be reviewed by the BICP program manager. i.e. Sickness/ injury – we will work to reschedule for a future course date or to receive a full refund of registration fees. BICP reserves the right to deny participation to anyone that BICP, in its sole discretion, believes is unable to meet the physical, psychological, cognitive, social or safety demands of our courses. BICP uses students’ names, photos, and other images, in promotional material, videos and press releases. BICP is committed to providing and maintaining a safe and healthy workplace for all workers (including contractors and volunteers) as well as clients, visitors and members of the public. Hazards and risks to health and safety will be eliminated or minimized, as far as is reasonably practicable. Mountain biking, by its nature, is a dangerous sport with unpredictable risks. Minor injuries such as scratches, bruises, and sprains can occur, as well as major injuries such as concussions, broken bones, and heart attacks. There is always a chance of catastrophic injuries including paralysis and death. 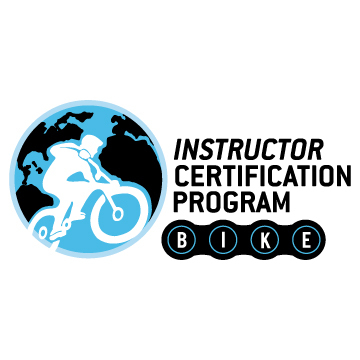 When you sign the BICP waiver that is required for participation in our courses, you are indicating you understand and agree to assume responsibility for the risks and dangers of the sport of mountain biking. The BICP works to provide a safe and comfortable learning environment. This includes free of violence for our employees, independent contractors, participants, Hosts, and Venues. Every member of the BICP has a personal responsibility to each other to treat each other with dignity and respect. The BICP supports and is committed to equal opportunity employment standards for all employees and independent contractors. The BICP acts in compliance with all laws and regulations related to equal opportunity employment and non-discrimination policies. The BICP’s non-discrimination Policy states, the BICP does not and shall not discriminate on the basis of race, color, religion (creed), gender, gender expression, age, national origin (ancestry), disability, marital status, sexual orientation, or military status, in any of its activities.